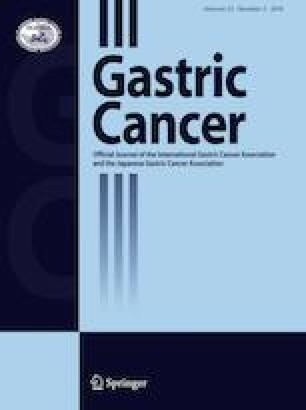 Defective mismatch repair (dMMR) and microsatellite instability (MSI) correlate with gastric cancer (GC) outcome. We hypothesized that MMR genetic polymorphisms that have low-penetrant effects but may cause heterogeneous MMR capability among individuals also affect GC outcome. The polymorphisms rs1800734 in MLH1, rs2303428 and rs3732183 in MSH2, rs735943 in EXO1, and rs11797 in TREX1 were selected and analyzed in independent discovery and validation sets that included 167 and 593 patients, respectively. MSI was determined. In both the discovery and validation sets, the rs2303428 TC + CC genotype correlated with poor overall survival (OS) in non-cardia (P < 0.05) but not in cardia GC. Multivariate models showed that for OS of patients with non-cardia GC, the rs2303428 TC + CC genotype was an independent predictor in the validation set (HR 1.54; 95% CI 1.02–2.32; P = 0.040) and had a trend to be an independent predictor in the discovery set (HR 1.70; 95% CI 0.96–3.01; P = 0.067). Furthermore, in both patient sets, fluoropyrimidines-based adjuvant chemotherapy improved OS for non-cardia patients with the rs2303428 TC + CC genotype (HR 0.14; 95% CI 0.04–0.57; P = 0.006; and HR 0.29; 95% CI 0.15-0.58; P < 0.001, respectively) but not for those with the TT genotype. The rs2303428 genotypes were not associated with MSI frequency. The rs2303428 TC + CC genotype correlated with reduced expressions for thymidylate synthetase, P-glycoprotein and ERCC1 (P < 0.05) in non-cardia GC. The rs2303428 genotypes may predict prognosis and adjuvant chemotherapy benefit in non-cardia GC patients. The online version of this article ( https://doi.org/10.1007/s10120-019-00962-8) contains supplementary material, which is available to authorized users. This project was supported by grants from the National Natural Science Foundation of China (Grant numbers: 81301765 and 81672896), Key Project of Zhenjiang City for Health Science and Technology (SH2016038), and Project of Young Medical Talents in Jiangsu Province (QNRC2016829). All procedures followed were in accordance with the ethical standards of the responsible committee on human experimentation (institutional and national) and with the Helsinki Declaration of 1964 and later versions. Informed consent to be included in the study, or the equivalent, was obtained from all patients.